Thought I'd give everyone a little gold and white today! I used an Impression Obsession die and then placed some gold card stock behind the cut outs. The sentiment (again) is from Stampabilities. That gold ribbon......mercy me, is it ever shiny!!! It's almost to the point of being gaudy!! A pretty clean and simple card - and another one completed for the year. Hopefully I'll get some of these Christmas cards addressed and mailed this weekend! Wow - just gorgeous!!!! Those trees are outstanding!!!! Love the SD background!!! Well, Lynn, you've done it again. Given us a gorgeous, classy card to admire. The ribbon doesn't look that shiny in your photo. The gold behind your trees looks super nice. Have a great day. Beautiful! Love the golden trees and the embossed swiss dots in the background - looks like snow falling. Such a stunner... the ribbon is just so sparkly... perfect for a Christmas card... These dies are so pretty. Just read that you thought that the gold ribbon is almost gaudy... you have made your card rather elegant with it. Nothing you make is ever out of place. Gorgeous card Lynn, I like the trees, the colours and the embossing. Those trees are absolutely stunning!! Oh my Lynn, this is gorgeous!! I love the white & gold color combo and your beautiful tree die!! The shiny gold ribbon is perfect! Oh my Lynn these trees are gorgeous. I am loving the ribbon too. Gorgeous card,Lynn!!! I love the white and gold.TFS!!! This is gorgeous Lynn - I love the embossed snow falling and the smooth snow on the ground. As for the shiny ribbon, well if you can't go a bit gaudy at Christmas when can you?!! BEAUTIFUL!!! Absolutely gorgeous! Must CAS your card, I have the dies and haven't used them! Very pretty! That gold backing for the trees is yummy! Nice job of tying that ribbon - like it lots! Gaudy? nah! Really like the gold with the white! This is fabulous Lynn! Those trees look gorgeous with the golden background showing from beneath those swirls! The ribbon is the perfect compliment for this classy and gorgeous beauty! Nice job!!! Those trees are fabulous! Great idea to put the gold behind it. It really makes the white swirls pop! WOW - love this Lynn - clean and simple and ever so elegant. Another elegantly gorgeous card! The swirly trees are so pretty and I LOVE the gold ribbon! So pretty Lynn, I love gold and white together. Love the Christmas trees and the effect with the die and the gold paper behind. Lynn, this card is stunning. I am so liking the gold and white color scheme, and the trees are quite lovely. That gold ribbon is a beautiful addition with its texture -- brings the whole concept and composition together wonderfully! Goodness- Fabulous idea- I love the die with the Gold behind it and the gold on the star. Beautifully done! 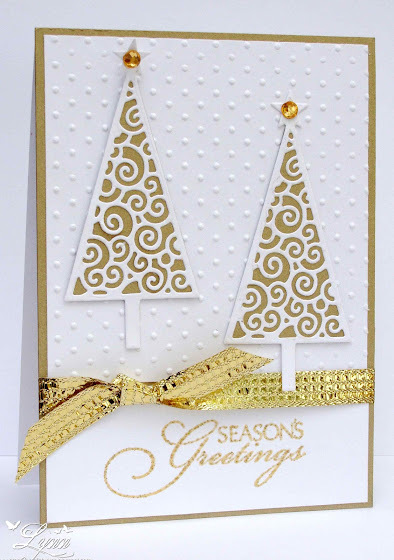 What beautiful gold trees with the delicately cut overlay! A very elegant card, Lynn!